Though I do whinge about winter with its short days and fewer opportunities for landscape photography, it is also the season for snow. Snow down here in the south-west of England is rare, especially at lower elevations, but every now and again some of the higher ground will get a coating of the white stuff. All it took was the rumour of a possible snowfall to get me excited and straight onto regularly checking the snow forecast for Dartmoor. As the weekend approached the number of times I was hitting refresh on my browser steadily increased. The "snow risk" percentage went up, then down, then up again. Towards the end of the week I was also checking the Dartmoor Webcam desperately hoping to see a dusting of snow on the ground. When I finally saw a little snow on the Dartmoor Webcam I decided that I was going to get up early the next morning and head to Dartmoor. Even without snow, the conditions up on Dartmoor can be arctic so the first step in getting organised was to get out all my winter layers. I know from bitter experience that if I found myself freezing cold that my enthusiasm for photography would be short lived and I would be home with a cup of coffee and bacon roll before sunrise. When I left in the morning there was no sign of snow but I already knew that I would have to go to higher ground. My planned location of Emsworthy (one of My 5 Favourite Locations for Landscape Photography in Devon) would probably be high enough so I wasn't overly worried. Sure enough just as I passed Haytor everything started to turn white. There wasn't a huge amount of snow, but I was sure there was enough to work with (or at least build a snowman). The signs looked good early on. 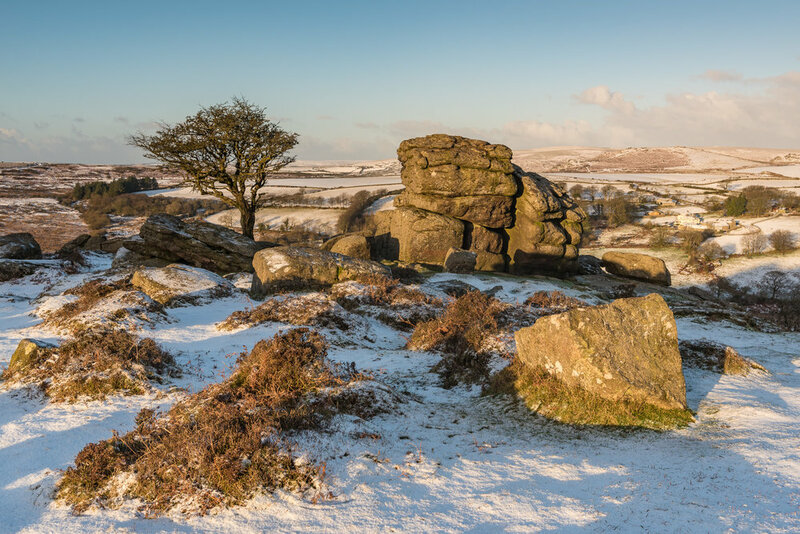 Naturally, snow on Dartmoor attracted a fair few photographers to come out so I wasn't overly surprised to be sharing my Emsworthy location with a couple of other local photographers. There's plenty of room at Emsworthy for three photographers so there were no issues over who was where and it was nice as always to have a chat and a coffee while waiting for the sun to come up. My vision for the image I was hoping to get was relatively straight forward. In the foreground are small clumps of ground, which when illuminated by the rising sun would hopefully turn the snow a nice golden colour. This coupled with the tree and the tor in the foreground, and some dramatic clouds would make a good image. All I had to do was wait for the sun to rise and bathe the ground, tree and tor in golden light. Landscape photography is rarely easy and conditions can change rapidly, for the better or for the worse. As I patiently waited for the sun to rise the cloud started to clear. Those nice big pink clouds that I thought would be a key feature of the image cleared from the sky leaving it almost clear. Not to be put off though I continued to wait. Another problem was that when the sun had risen over the horizon, it wasn't high enough to shine over the hill behind me. What I hadn't taken into account was that during the winter months the direction of the sunrise meant it would be around 30 minutes before the sunlight would hit the foreground at my location. The problem with the sunlight 30 minutes later is it can be a bit harsh and will have lost some of its morning warmth as you can see with the image that I took below. Nikon D750, Nikkor 24-70 f/2.8 VR at 38mm, F/11, 1/40 sec, Lee Filters ND Grad, post processed in Lightroom CC. So while my first image lacks the punch I was hoping for I did learn something from the experience. I've shot Emsworthy a few times in the morning, but that doesn't necessarily mean that it's a good sunrise location all year round. Though I use The Photographer's Ephemeris to plan my shoots I've learnt that not only do I need to pay attention to the direction of sunrise, but the height of the surrounding ground. Alyn Wallace has actually produced an excellent video on how he uses The Photographer's Ephemeris to plan around changes in ground elevation. I shall be watching his video a few more times! Also, be sure to check out Alyn's work, it's inspiring stuff. Unfortunately the arctic conditions didn't last the weekend. The snow on Dartmoor didn't really last past that weekend so I was unable to go back out and try again. So while I was unable to get the image I was hoping for it was great, as always, to get out with the camera and practice the craft of photography. I also learnt something new about one of my favourite locations and how to plan a little bit better. So overall I call that shoot a success! So have you been out with your camera in the snow recently? Do you use The Photographer's Ephemeris to plan your shoots? Let me know in the comments below.